There are times when you need to include additional account details for a service account, such as a department name, business address or phone. These details would appear within the Global Address List (GAL). By default, only the first and last name of the service account will appear within the Global Address List. To manage/set additional details, follow the steps outlined below. Important: Only domain administrators and authorized admins can manage these settings. This information will only appear in the GAL if the account is made visible in the GAL. 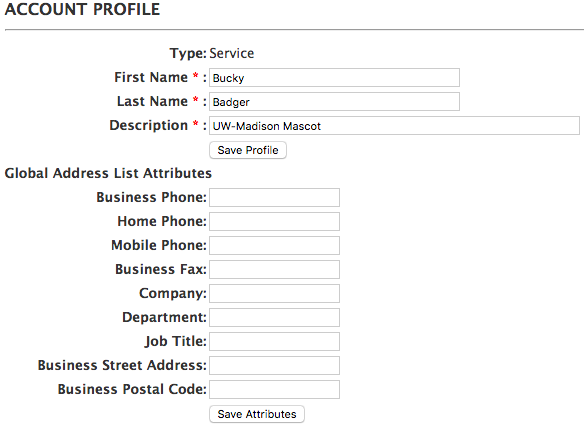 Log on to the Wisc Account Administration site. Search for and select the service account you want to manage. Within the "Account Profile" page, enter the desired information and click Save Attributes. Note: The information may take up to 24 hours before appearing within Global Address List. In addition, service accounts are hidden within the GAL by default - to manage this, review Office 365 - Show or Hide Service Account within Global Address List document. If you are looking to manage the information for a NetID account, please contact you HR office.